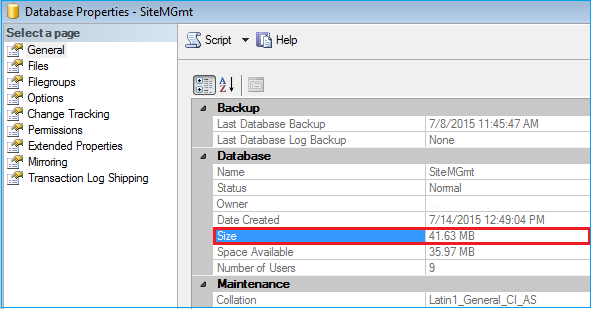 SQL Server 2014 Hosting - HostForLIFE.eu :: How to Check Database Size in SQL Server 2014? 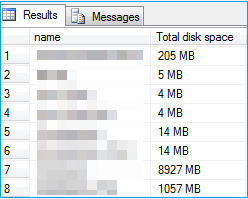 Sometimes we'd like to understand how much space utilized by databases in SQL Server. There are multiple ways that to know the database size in SQL SERVER. This is one option by that we will know database size. Below query uses 2 tables databases that contains database ID, Name etc and another table master_files which contains size columns holds size of database. By using Inner join(database ID) we are getting database size. each tables are present in master database. See the following picture after executing above code which gives all the databases with their sizes. This is second choice to recognize database size. Here we are going to call stored procedure sp_spaceused which is present in master database. This one helps to know size of current database. After calling above stored procedure it shows below Image2 which contains column called database_size surrounded by red mark. This is another option to know database size. To know size Go to Server Explorer -> Expand it -> Right click on Database -> Choose Properties -> In popup window choose General tab ->See Size property which is marked(red) in Image3. Hope it helps you to get database size in SQL Server! In this blog post “Report Viewer wrap text”, we are going to learn an important trick of text wrapping in SSRS reports for long texts (without space and any separator) exceeding the width of a report column’s defined width and being rendered in a Report Viewer control of .NET Application. 2. Add a Datasource and a Dataset in the report. 3. In query type of Dataset, select “Text”. 4. Add below as query in “Query” box of the Dataset. You can also write your own query. 5. 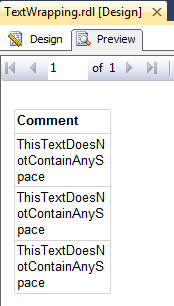 In above query, we have a text string without any space as a column named “Comment”. Now add a “Table” control from Report Item’s tollbox on the report body and select this column named “Comment” in the table to display. Remember you have fixed the column width less than the above string’s length to produce the mentioned issue. Again you can see that we have the desired output i.e. text wrapping is taken care as per the column width. 1. Create a ASP.NET Web Application in Visual Studio. 3. 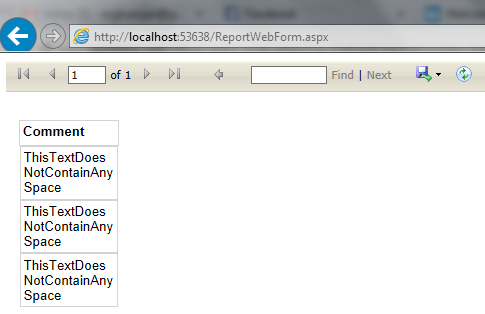 Add an .aspx web form in the project and on this page register the report viewer control as below. 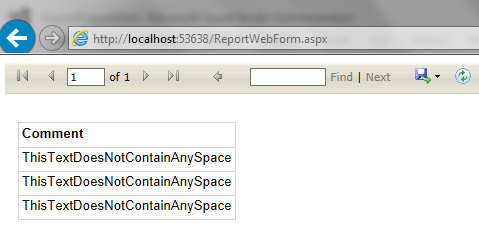 Before that also add the reference of reportviewer assembly in project references. 5. Write a code to display your report from this report viewer control in .cs file of this web page like below. You can modify the below code as per your need. I did not have any parameter in my report to keep this demo simple and to focus in main issue. In above figure, you can see that the output of the same report has been changed. The text wrapping is not working as it worked in above cases which was desired too. In this case width of the column is expanding to accommodate the text instead of wrapping the text in more than one row. 2. To avoid rework, go to your report project and click on the textbox which holds this data inside the table and press ctrl + X to cut it from the table. 3. Drag and drop a rectangle control in the table’s cell from the Report Item’s toolbox. 4. Press ctrl + V to put the textbox inside the rectangle. 5. Set the border of the rectangle as your textbox has. In this post, we will convert a given date of range into list of dates as per the business requirement. Just have a look on as these three mentioned demo table below which has three columns CustomerID, StartDate and EndDate. 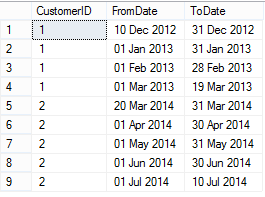 So, we want to generate the date list for the given date range for each customer. For example if we have a entry as CustomerID – “1”, StartDate – “10-Dec-2012” and EndDate – “19-Mar-2013”, then this should return a date list for CustomerID 1 with 4 rows. First row for 10-Dec-12 to 31-Dec-12, Second row for 01-Jan-13 to 31-Jan-13, Third row for 01-Feb-13 to 28-Feb-13 and fourth row for 01-Mar-13 to 19-Mar-13. Mind that in first row, we have started with the actual start date of the given date range and in the last row, we have put the end date as actual end date. But, if there is any more row between first row and last row, it has a date range as whole month. Insert serial numbers up to 100 for this demo using sys.columns table. You can also use another way to insert this. Now, write a SQL query to extract the output as required. You can also try with some different way using DateList table too. Here, we're gonna use a serial number to generate the rows and date list dynamically for the given date range. And you're done! You can also generate it in some other way too. For example, you can achieve this with a demo DateList table too. It's your creativity to find your own way. There is a long list of new features getting introduced in SQL Server 2016. In this post, we would talk about one of the security feature called Dynamic Data Masking. How to Use it? Whenever you access your account on your bank site, would you be comfortable in seeing your credit card or bank account number in clear text on the web page? There are multiple ways to do this at the application level, but as a human nature, it leaves room for error. One small mistake from the developer can leak sensitive data and can cost a huge loss. Wouldn’t it be great if a credit card number would be returned with only its last 4 digits visible – XXXX-XXXX-XXXX-1234 with no additional coding? Sounds interesting, read on! Before experimenting this feature please remember that if you are using CTP2.0 then you need to turn on trace flags using below command. If you don’t enable, then here is the error which you would receive while trying this sample script given later. As we can see above, those fields which are masked are showing obfuscated data based on masking rule. For your information, versions after CTP2 release, the trace flag will not be needed. If you add trace flag, you would start getting “Incorrect syntax” error. In this article, I'm introducing you new feature in SQL Server 2016 CTP 2.0 named Query Store. This is a very useful feature for the DBA and developers from the performance point of view. Query store feature allows to captures multiple query plan for a query and run time statistics. Query store can store multiple execution plans per query, it can force query processor to use a particular execution plan which is referred as plan forcing using USE PLAN query hint.